Infineon Technologies introduces a new family of 2-channel isolated EiceDRIVER™ ICs for use in high-performance power conversion applications. The new gate-driver IC family is suitable for high-voltage PFC and DC-DC stages as well as for synchronous rectification stages in server, telco and industrial switching mode power supplies (SMPS). Moreover, they can also be used in applications such as 48 V to 12 V DC-DC converters, battery and electrical vehicle charging stations as well as smart grid and solar micro-inverters. The EiceDRIVER family offers precision timing characteristics, 7 ns accuracy for input-to-output propagation delay and maximum 3 ns channel-to-channel exactness, both across production and temperature range, enable the next level of power conversion system efficiency. 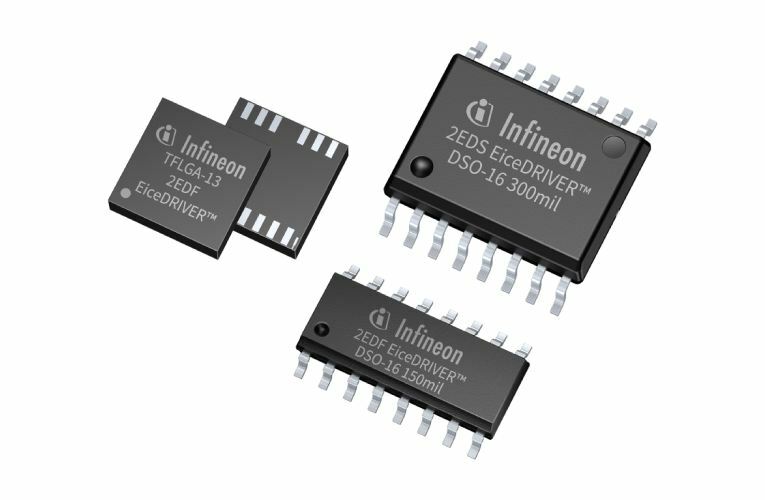 The overall switching efficiencies of Infineon CoolMOS™ and OptiMOS™ power MOSFETs can also be greatly increased by the EiceDRIVER source and sink currents (up to 4 A and 8 A respectively). The family’s robust integrated galvanic isolation is important for hard switching half-bridge configurations, both from input to outputs as well as between the output channels. Additionally, integrated reinforced input-to-output isolation provides vital electrical safety where needed. The low resistive output stages of the EiceDRIVER product family reduce internal power dissipation to the minimum, thus the gate-driver IC can deliver maximum power to the gates of power MOSFETs. In addition, when the power MOSFETs are intended to be off, the low-ohmic output stages firmly hold the MOSFET gate voltage at zero, thus avoiding undesired spurious turn-on. ◦ 300 mil 16-pin DSO (reinforced isolation). Five initial products of the family can be preordered. Visit Infineon website for more information.